Nou te repibliye le e nou mande padon pou sa! 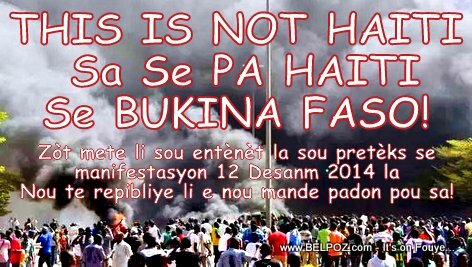 Mezanmi gade photo saa... Haiti - Manifestation 12 Decembre 2014 - Lafimen ap monte... li sanble yon malè pandie sou peyi a... Kisa-w panse? Nan kisa nou pran laa? Most probably none of this would have been occurring had the Matelly-Lamothe administration along with its croony politics and its souflanchous had the decency to work with and for the nation with respect for others. Mwen konpran'n kote sa ap mennen peyi a, mwen konnen gen grangou vre, opozisyon an pa ka defann anyen pou peyi a.
pa kraze peyi a, se moun de karakte sa yo nou te bezwen. kite peyi mache banm volé. PLEASE PLEASE PLEASE stop publishing all the bad news. The trouble makers love it when you put them on front page, and the rest of the world just goes, "Haiti will never change." Please how about a list of all the GOOD THINGS that have taken place over the last 4 years?